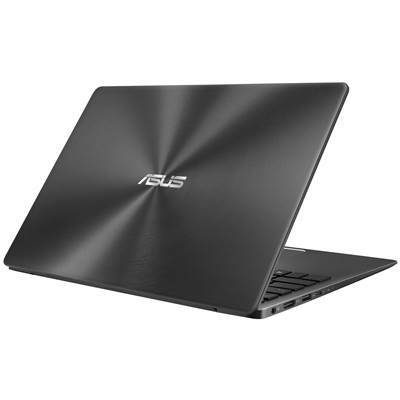 The new ZenBook 13 gives you all the elegance and style you expect from a ZenBook — and a whole lot more, with a sophisticated modern design that places it in a class of its own. 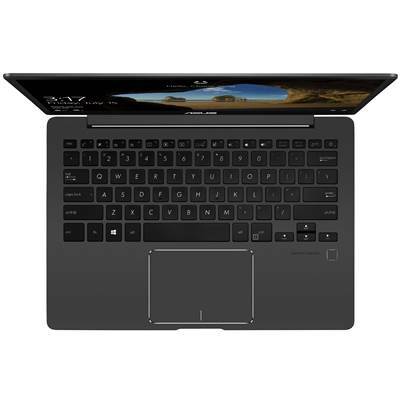 This ultralight marvel features a high-performance discrete graphics chip, giving it all the pixel-pushing horsepower you need for creativity and entertainment: editing videos, manipulating photos, or just enjoying your favorite movies and games. It's speedy. It's thin and light. 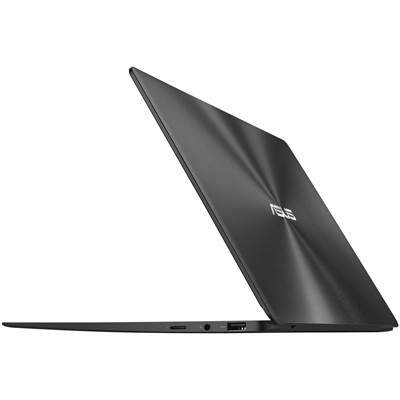 It's ZenBook 13! 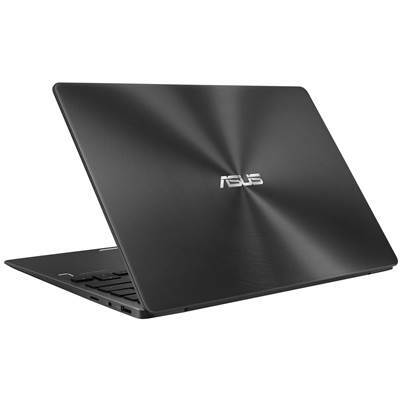 ZenBook 13 is not just a superbly capable laptop — it's also a powerful style statement. Its sleek and sophisticated profile is finished in classic Slate Grey. It is further adorned with our iconic Zen-inspired spun-metal finish. To give you the biggest screen in the least space, ZenBook 13 has a beautiful NanoEdge touchscreen*, with an ultrathin 6.86mm bezel that gives it an impressive 80% screen-to-body ratio. With no distracting bezel, you'll feel more immersed in your tasks. 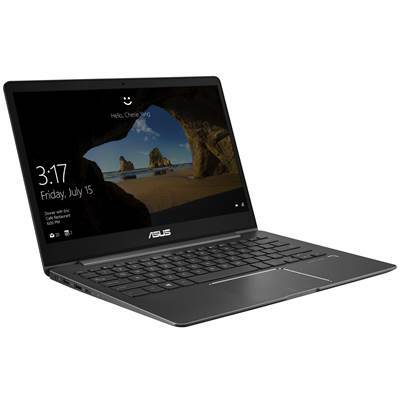 This amazing 13.3-inch FHD touchscreen* fits in an ultra-compact frame, giving ZenBook 13 a footprint smaller than many 13-inch models. And its 178° wide-view technology ensures that image quality isn't degraded when viewed at extreme angles, so it's great for collaborating or entertaining. 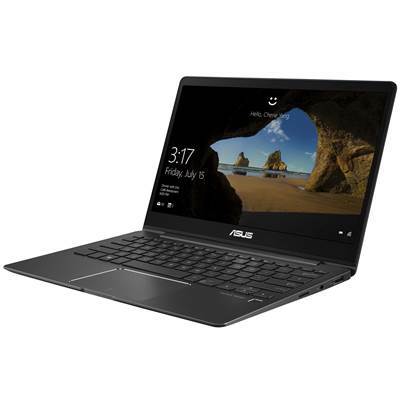 If you need an ultrathin Windows 10 Pro laptop with serious processing power and class-leading graphics performance, ZenBook 13 is the perfect choice. At its heart is the latest 8th Generation Intel® Core™ i7 processor — which can be boosted to 4.6GHz when needed — with 16GB RAM and an NVIDIA® GeForce® MX150 discrete graphics chip. And blazingly fast storage is provided by up to a 1TB PCIe® SSD. So whether you’re creating mega-sized office documents, manipulating high-resolution photos, editing HD video, or simply taking a break with the latest high-powered games, ZenBook 13 will never keep you waiting. 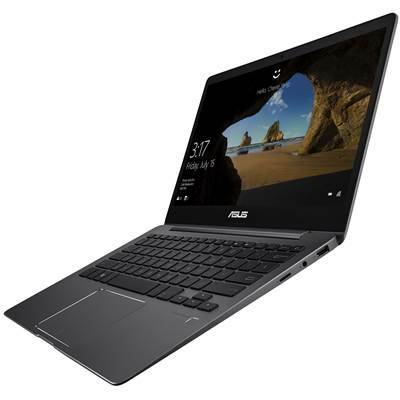 Designed for non-stop, on-the-go lifestyles, ZenBook 13 offers the freedom of all-day battery life. 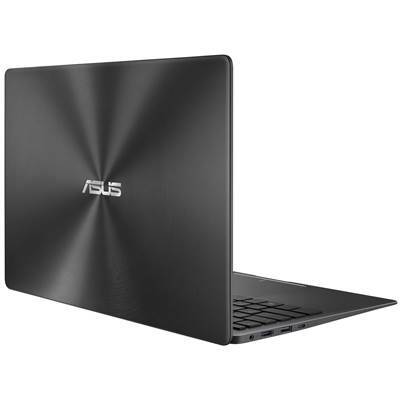 A specially designed 50Wh lithium-polymer battery gives ZenBook 13 up to 14 hours of autonomy, with fast-charge technology that takes just 49 minutes to recharge to 60% capacity. Lithium-polymer batteries retain most of their original charge capacity even after hundreds of charge cycles — giving them a lifespan that’s up to 3X longer than standard batteries, so you don't have to worry about deteriorating battery performance. ZenBook 13 is equipped with a full-size backlit keyboard that features a sturdy single-piece design to deliver a superb typing experience. 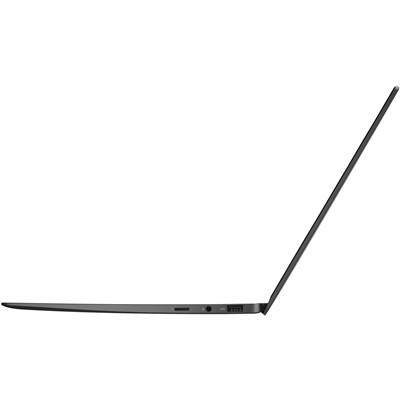 It's a masterpiece of ergonomics, with 1.4mm key travel that’s optimized for comfort. The Precision Touchpad is engineered for maximum comfort and accuracy, with a glass covering for smooth control. It features palm-rejection technology and supports multifinger gestures and handwriting. 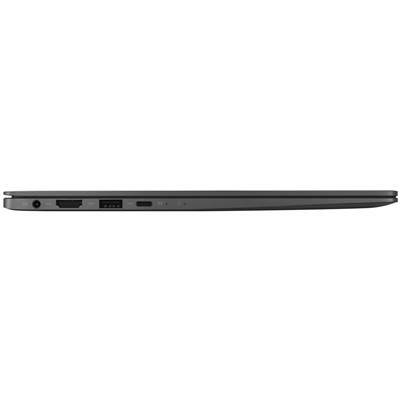 Accessing your ZenBook 13 couldn’t be easier or more secure. Thanks to a built-in fingerprint sensor in the touchpad and Windows Hello, there’s no need to type in your password every time to log in: Just a single touch is all it takes. The sensor makes it easy to log in while on the move, and there's no chance of anyone sneakily spying on your password! With ZenBook 13 and Windows 10, you get the very best computing experience. ZenBook 13 supports all the great new features in Windows 10, including Windows Ink, Modern Standby and Cortana. Windows Ink lets you annotate, sketch and capture your creativity in an intuitive and natural way with the ASUS Pen or other active stylus — even from the lock screen. You can add sticky notes, draw on screenshots, work with any Windows Ink-enabled apps, and much more! With Modern Standby, your ZenBook 13 provides an instant-on, instant-off experience — just like you're used to with your smartphone. It's always ready to go, so you’ll never have to wait. Windows Cortana, your personal digital assistant, intelligently helps you to organize your busy life for a truly personal Windows experience.